"There are a lot of people out there that just need that one extra step to put them on their feet, like how we were"
With record high rental and home prices in Denver, Johnathan Hawkins, 25, and his wife Shandale, 23, rented the only place they could afford: one small bedroom to share with their toddler, Anabella, 2, in Johnathan's parent's house. Living in a house with a total of 11 people, their situation was not ideal however it was the best, if not only, option the couple had. Though they were both working, Johnathan was also in school and renting an apartment of their own would mean barely being able to make ends meet each month. "We wanted to save up, we wanted to be prepared," Shandale said. When Shandale became pregnant with their second child, Hilkyah, now 13 months, sharing one room became completely unmanageable. The couple was still not sure how they would be able to afford an apartment large enough for their growing family. They felt like they were completely out of options until they were referred to Volunteers of America's Brunetti Lofts. Volunteers of America Brunetti Lofts is a 23-unit apartment building in Denver's Five Points neighborhood and is uniquely designed to assist families from transitional housing to home ownership in less than five years. "Our program is geared toward the working family, someone who is really motivated to own their own home and is thinking towards the future," Marshalle Voltz, Family Service Manager for Volunteers of America's Brunetti Lofts. In time for their son's birth, the Hawkins family moved into a spacious apartment in Brunetti Lofts with income based rent, allowing them to do something very important to them: begin to build up savings. In addition to meeting their immediate need for housing, living at Brunnetti Lofts helped the Hawkins family plan long into the future. They received training on home buying and referrals to resources such as down payment assistance. "They make you aware. We had no clue about anything involving the home buying process; we didn't even think it was possible," Johnathan said. 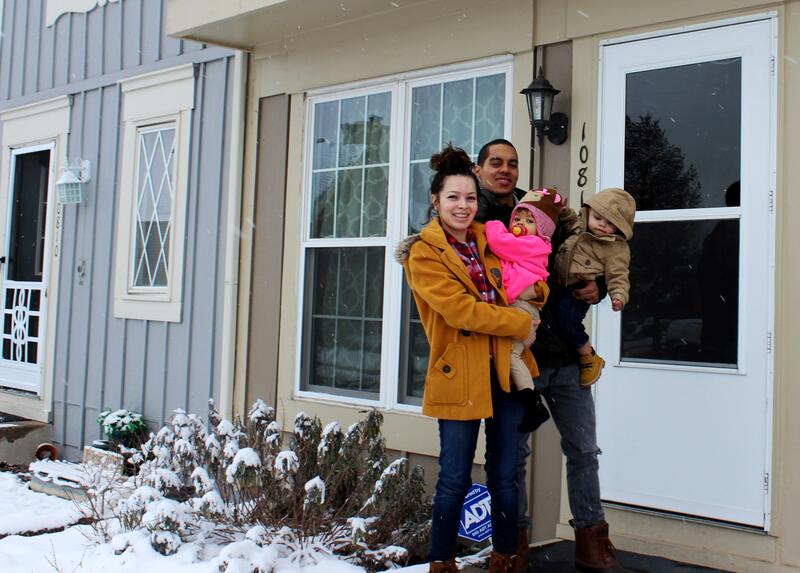 This past November, Johnathan and Shandale closed on their first home. Their 3-bedroom, 2-bath townhome right off Main Street in downtown Parker, CO was recently completely renovated and is a perfect fit for their family. The home is close to Johnathan's job and to parks for their kids to play. In their new home, Shandale and Johnathan said they still feel like they are dreaming. "There are people out there who care and want to help you and that is what Brunetti does. Not only do they provide you with a place to live at an affordable cost, they want to see you succeed, they want to see you graduate to being a homeowner," Johnathan said. This ambitious couple is not done dreaming. They plan to continue saving and hope to eventually own a single family home. Johnathan is pursuing a master's degree in sociology and says he hope work in human service to uplift people in the same way that Volunteers of America has helped his family. "There are a lot of people out there that just need that one extra step to put them on their feet, like how we were," Johnathan said.